It’s October and in honor of our 31 Days of Death I’m exploring the deadly reputation of everyone’s favorite yellow berry. 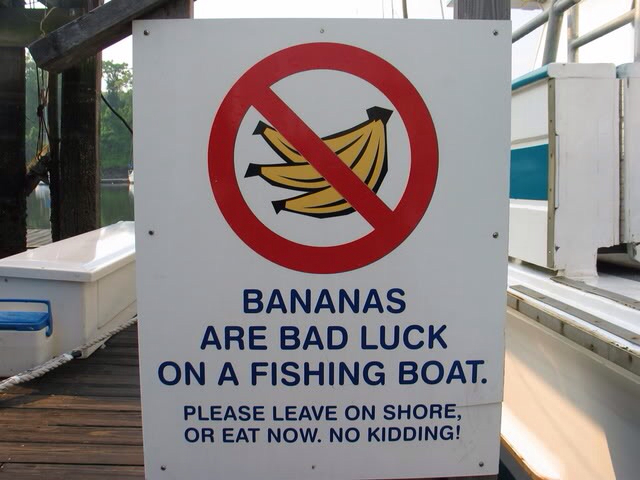 For at least a century now, it has been a common superstition among seafarers that to bring a banana on board a ship is bad luck. Nobody know’s where this myth came from, however a number of theories have been proposed to explain how the yellow fruit got such a bad wrap (or should I say peel). One is that in the old days, sailing ships transporting bananas would throw caution to the wind (literally) when transporting the berry (yep, it’s a berry) in order to get to their port o’call quickly before the bananas spoiled, therefore they were more likely to have accidents. Another theory is that bananas give off ethylene gas as they ripen and a buildup of this gas in the hull may have caused crew members to become ill. A third theory is that the infamous banana spider would find its way into the ship, get loose and bite crew members, causing them to die very painful deaths. Of all the explanations, the one that I found was most likely to happen may surprise you. 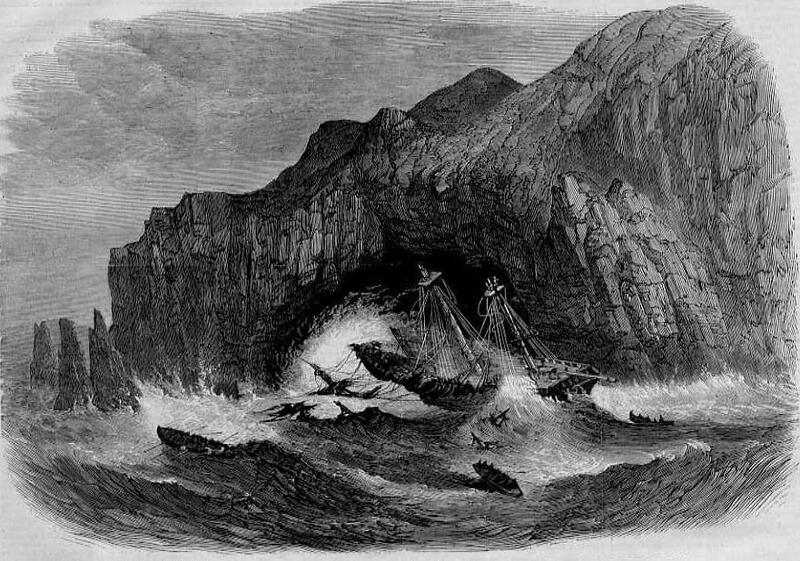 Wreck of the American Ship “General Grant” on Auckland Islands, May 14, 1866. Artist unknown. Source: Wikimedia Commons. Theory number one is very unlikely because bananas were not commonly exported to North America and Europe until the late 19th century, a time when the shipping industry was experiencing great leaps forward in technology. Also, in those days the most commonly consumed variety of banana was the Gross Michel, which was more robust than modern Cavendish bananas and had a longer shelf life (you can read about the unfortunate demise if the Gros Michel HERE). On top of all that, part of the popularity of bananas was how cheap they were and they were grown in such large numbers that it’s hard to imagine crews risking their lives to deliver just one shipment. So the idea of ancient wooden ships clipping through mysterious, pirate infested seas with a cargo of dying bananas becoming more worthless with every passing second is hardly accurate. The second theory is equally full of hot air (pun intended) because the levels of ethylene released as bananas ripen and spoil are not nearly enough to cause harm to humans. Also, it should be noted that bananas aren’t the only fruit to release ethylene as they decompose, apples and pears do as well. In fact, the common idiom “one bad apple spoils the bunch” is said to be inspired by the real problem that occurs when one apple spoils, releases the gas and accelerates the ripening of the other apples in a container. You probably don’t become alarmed when you see a bunch of spoiled apples and neither should you upon seeing rotten bananas. Brazilian Wandering Spider on display in our special exhibition “Death By Natural Causes”. So finally we’re left with the most ridiculous explanation of all: evil, killer spiders. The thing is, out of all the explanations I’ve researched so far, this is the only one that I actually found documented proof of occurring. Here’s just ONE of the articles I found describing “Banana spider” incidents. The spider genus Phoneutria has two very interesting common names and both are inspired by the spiders’ somewhat unusual behavior. They are most commonly referred to as “Brazilian Wandering” spiders, the name refers to the arachnid’s nomadic life style. 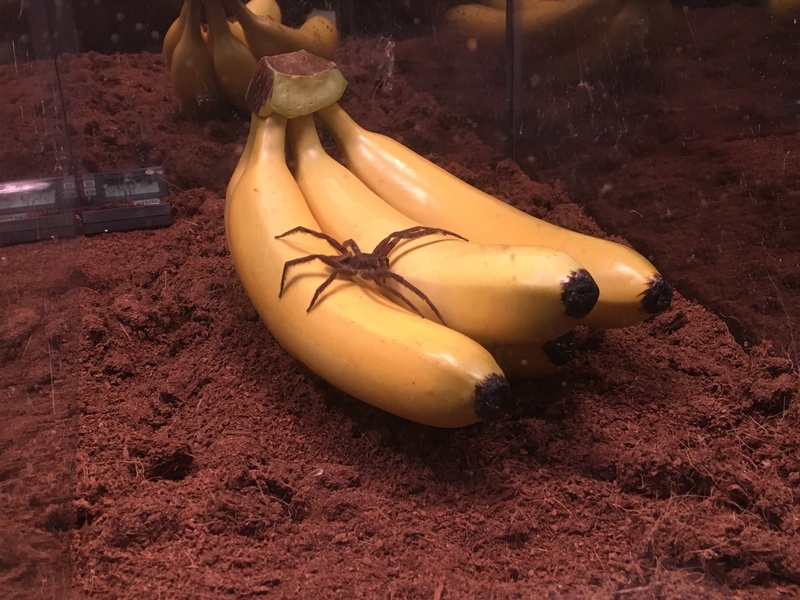 Unlike most other spiders, these guys don’t live in lairs or on webs, they just wander around and take refuge wherever they can, including inside shoes, clothes and even bunches of bananas. That last potential home inspired the less commonly used nickname: “Banana spider”. Female of P. cf nigriventer. This and other species of the genus Phoneutria have medically significant venom that can be dangerous if the spiders are handled. Author: João P. Burini. Source: Wikimedia Commons. The effects of being bitten by a Brazilian Wandering spider are pretty dramatic. Their bite has been described as the most excruciatingly painful envenoms of all spiders, causing intense burning pain, abdominal cramps, nausea, convulsions and a number of other unpleasant symptoms. Luckily, in the vast majority of cases the spider doesn’t inject all of its venom when biting someone, so the symptoms, though quite painful, do not include death. This is because once they use all of their venom, the spiders become vulnerable to attack for a considerable time until their bodies can manufacture more. So it’s better for them to be thrifty with their deadly toxin. So what does this mean for the banana curse? Well, interestingly enough, the only explanation I haven’t been able to disprove is the most ridiculous sounding theory: killer spiders. However, although it is possible that a Brazilian Wandering Spider may have wreaked havoc on a ship at some point, it still pretty unlikely. 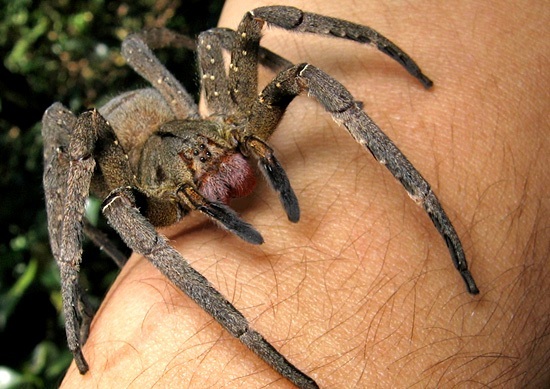 Deaths from Brazilian Wandering spider bites are very uncommon. Even in Brazil, the spider’s home, there were only 10 deaths attributed to the infamous arachnid in 2008. In the end, it looks like the curse of the killer banana is just a myth after all. If you want to see a Brazilian Wandering Spider in Person, come see our special exhibition Death By Natural Causes. Not only will you come face to face with the infamous Banana spider (quite friendly in person) you will see a number of other deadly creatures and toxins you don’t know surround you in your everyday life. Previous Post Sky Happenings This Month: The Autumn "Intermission"